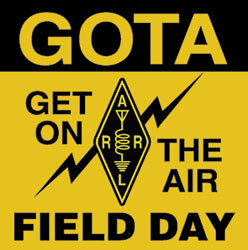 Field Day is an ARRL sponsored operating event intended to test emergency preparedness. 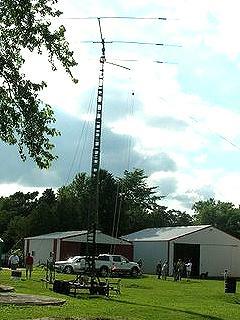 The two day event is held on the last weekend of June with literally thousands of individuals and clubs "heading for the woods" to set up amateur radio stations operating on emergency power. 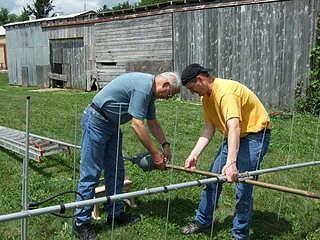 Bill KCØWIM and Doug KDØUGB assembling the 2m VHF antenna. The RARC field day event this year was a smashing success, operators, and bystanders all got a taste of what Ham Radio can be under abnormal circumstances. The point of Field Day is to simulate a catastrophic emergency where permanent structures and systems are unavailable and the Ham must fend for themselves. 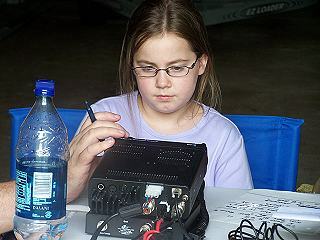 We operated from the Cahill farm in south-east Minnesota for the year 2007 event, using no power from the electrical grid to run the radios, instead we relied on generator and battery power. Yes we even used solar power! This year the RARC chose the 3A category for entry. One Morse Code (CW) station, one Voice (SSB) station, and one digital (PSK31) station were in operation at the same time. The bonus "Get-On-The-Air" (GOTA) station doesn't count towards the transmitter class, but instead is there as a 'free' station, to allow non-hams or those who don't operate HF much, to make contacts under MUCH less stressful circumstances. 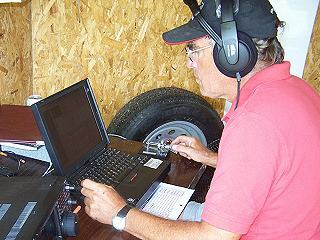 Peter N8MHD operated his own station under his call sign at "QRP" or low-power levels. 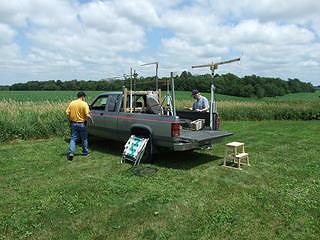 We also put together and operated a VHF station for a good part of the contest, Mel, KC0P, headed up the VHF operation in what I call the "Mel-mobile" pictured here. This station attempted contacts with both the International Space Station (ISS) and OSCAR satellites. We were able to hear at least one satellite, but were unable to complete a contact. Mel brought along equipment for 50mhz, 146mhz, 440mhz, 1.2ghz, and 10ghz. We completed contacts on multiple bands, and even tried a "DX" contact on 10ghz with a station out of the twin cities. I enjoyed watching Mel methodically make a contact with one station on about 4 different bands, each time agreeing on a frequency and who would call first, and just-like-that he would log them. It wasn't quite the 50-60 contacts per hour we were experiencing on the "big" HF stations, but he rolled them in just the same. Field day is all about improvisation, you make things up as you go. The ladder makes a very convenient antenna tower when lashed to something relatively solid. 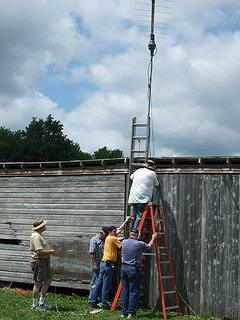 We also put a high definition UHF tv antenna up on a hay wagon, its front guard rail provided the lashing point. When you're operating under "Emergency" conditions, you get to make up new ways to do things. The recent hurricane disasters brought standard communication infrastructure down completely. A hurricane doesn't spare ham radio towers either, so one has to make-do. During the event the G5RV antenna designated for the digital station broke, and we had to improvise another dipole and support it. So far we haven't attached a lawn chair as an antenna, but that is on my list of "things to try." 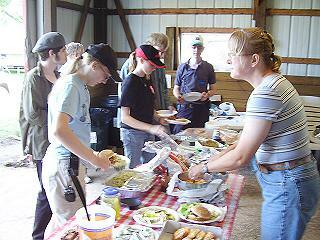 Famous Dave's (NW) provided Pork Sandwiches and Coleslaw for 40 members for our potluck on Saturday! What a gracious donation - thanks Amber! Olmsted County Rental Center agreed to supply us with tents and the use of a generator. Jim is GREAT to work with! Victoria's is donating a gift card for a door prize, if we have one! (perhaps a prize for the top #of contacts by an operator??) Thank you Jason! Peter WØSA at the CW station. This station consisted of an Icom 756ProIII and Tokyo Hy-Power amplifier, putting out ~600w of cw into vertical dipoles for 20 and 40 meters (14 and 7mhz respectively.) The station was under computer control, saving many thousands of dits and dahs on the paddles. Fred, K4IU, Peter N8MHD, Scott WØMD, and of course Peter Cross WØSA manned the CW station. Why use Morse Code now you ask? Well, they made 1381 contacts, while the voice and digital stations combined only made 1187 contacts. Throughout the course of the contest, these guys just kept plugging away, running our total score up 2 points at a time. It really pays to have a good CW operator or six! My favorite station was the voice station, because of course anybody can sit down and operate. I'm not so fast with morse code. An Icom 756Pro and SB-220 amplifier fed this 3 element beam antenna with 800-1000w. It was interesting to listen to the generators straining under the load of each station. One needs a very stiff power supply to make a 1500w amplifier put out 1500w (the legal limit for those non-hams reading this). I personally racked up a couple of hundred contacts in the wee-morning hours, and logged #799 before the caffinated beverages quit working and I headed home. There was many other operators including but not limited to: Dave KØVH, Scott WØMD, BJ, KCØNPF, Pat, NØADQ, and [others]. This year's strategy was to hold a frequency and wait for the contacts to come to us, rather than 'hunt and pounce' operation which we've used in years past. Pat noted that this year our contact levels were about 20% higher than in years past, so something worked. Peter N8MHD at his call separate QRP Elecraft K2 station; Randall (listening station) and Bob ABØBW look on. Peter took the opportunity for some tent camping. Of course, 1000w makes it easier to contact stations, but that's not the only way to go. Peter N8MHD operated the entire contest at 5w, operating an Elecraft K2 off of a solar charged battery. The solar panel was enough to operate the radio while receiving, the battery was necessary for transmission and when a cloud rolled by. GET ON THE AIR (GOTA)!!! There is no morse code test for those non-hams reading this!! Ham licenses have never been easier to get. 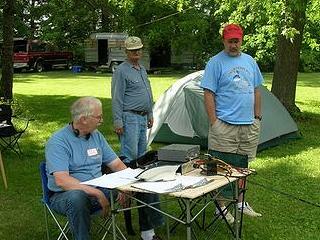 The entire purpose of this station is to allow new hams, or non-hams to operate at field day without pressure. The contacts don't roll in at 60 per hour, they come in as slow as you want, and there's an "Extra" class ham operator there to coach you too! Next year GET ON THE AIR at field day! LET'S EAT! The under-21 group around the much anticipated Famous Dave's BBQ Sandwiches! KCØWIP did a little work behind the scenes, and as a result, we were able to munch on GREAT food from Subway, Famous Dave's, Panera, and Baker's Square. Here you see a few of the younger folks grabbing a bite to eat for dinner after a busy afternoon. Around dinner time, we received a visit from Councilman Bob Nowicki. It seems that no matter where I go, Bob pops up somewhere. It's great to see our local leaders taking an interest in ham radio. The general feeling among most government officials is that ham radio is old and antiquated. This is simply not the case, our rigs are computer controlled, and can communicate everything from morse code to pictures. E-mail is faster, except when it doesn't work. Then the hams kick in, and yes, we can still send pictures without the internet, and did so at field day. Hey look at what we can't do! to the right you see KC0UTI and KC0NPF operating some... toys!! Another hobby of mine is top spinning. What you see in the picture is a "diabolo" and yes that's Spanish for devil. They're quite the fun toy to be able to play with, and I've spent a few years learning. The beautiful YL is also learning, and she can toss these around quite accurately. Sarah KC0ZNB at the GOTA station. 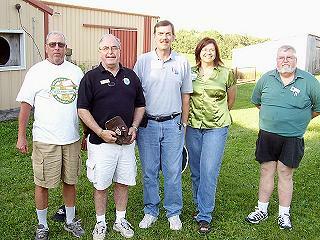 Club officers with Rochester City Council guest Bob Nowicki (black shirt).